The Outback Way Art and Artisan trail captures the diversity of the Art and Artistic talents. 29th June- 7th July: The Vision Splendid Outback Film Festival – www.visionsplendidfilmfest.com.au – 2018 theme- The Open Road. 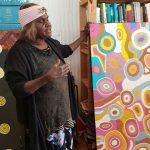 Thursday, September 6, 2018 – 17:30 to Sunday, October 21, 2018 – 16:00 The Desert Mob Exhibition- Araluen Art Centre Alice Springs, including Exhibition, Symposium and Market Place, is an opportunity to view new developments in Aboriginal art, to meet the artists, listen to their stories and share their culture in the heart of their country. Art from throughout Central Australia. The local Artwork in the Boulia Hotel is by Carol Anderson and Indigenous Art is hanging at Bob Spilsbury’s – Waddi Tree Souvenir shop.. there are soapmakers and silversmiths on stations around Boulia- so you may be lucky enough to find local souvenirs at the Min Min Encounter. There is local Artwork, handy work and craftsmanship in the local CWA shop a few doors down. Gem Tree– travelling east on the Plenty Highway – Gem Tree is another ideal location to pick up a nice Garnet or Zirconia- you can find it yourself or choose one from the Gem Shop… settings can be designed and completed in store- stay few days- enjoy the delicious camp oven dinner on Wednesday and Saturday nights and enjoy the rather unique glimpse of what life was like for the pioneers in the desert. Alice Springs- well the list of Art Galleries is significant in the Indigenous artwork hub- works come from all the surrounding communities – well worth a day of doing the Galleries in Alice Springs. This is a must see- Lyndee Severin and her daughter Amy have created a truly unique paper making experience. 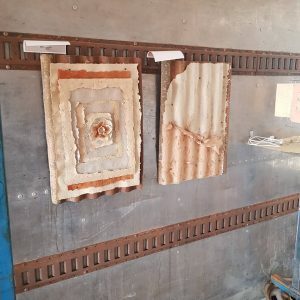 They have mastered the art of making paper out of native grasses, this paper than becomes packaged into notepaper, jewellery under resin, sculptures and artworks.. truly an exceptional hands-on experience- you can make your own. Curtin Springs offers accommodation so stay a day or so and enjoy the history of the station. Bush Tucker Journeys- Daily Bush Food workshops- talk with your Hotel reception. Docker River Art Centre– recently opened art centre in Docker River just near the NT/ WA border.